Context: Noise pollution has been well-recognized as one of the major trepidations that can adversely affect public health and quality-of-life in urban areas across the globe. Community noise, or environmental noise, includes the primary sources of road, rail and air traffic, industries, and public works. Aims: The main aim of this study is to assess the noise level inside the University of Dammam (UD) campus. Settings and Design: Three different locations were selected for measuring noise levels during this study; outside walls, the internal streets, and inside several buildings of the UD campus. Materials and Methods: Levels of the environmental noise pollution were measured at three different periods of the academic year 2011-2012; during study days, final exams and the holiday periods. Statistical Analysis Used: Results of this research were statistically analyzed by the Statistical Package for the Social Sciences SPSS program. Results: Levels of noise outside walls of the UD campus were higher than those inside the campus walls at all periods. Inside the UD campus, levels of noise were the highest at locations that are characterized by the high traffic movement. In addition, the highest level of noise was recorded during the studying period, while the lowest level was obtained during the holiday period. Levels of the indoor noise inside buildings of the campus were nearly the same or very slightly higher than those of the outdoor levels which indicate that the effect of human activity inside university buildings on noise pollution can be neglected comparing with the outdoor sources. Conclusion: Both levels of noise inside and outside buildings were higher than their guideline values. These high noise levels require effective environmental control strategies and increasing awareness between all staff members inside universities camps. تعتبر الضوضاء من أهم الملوثات نظرا لتعدد مصادرها. وتسبب الضوضاء البيئية أضرارًا صحية. تهدف هذه الدراسة إلى تقييم مستوى التلوث الضوضائي داخل جامعة الدمام. تؤكد النتائج أن المصدر الرئيس للتلوث الضوضائي داخل جامعة الدمام هو حركة السيارات سواء خارج أو داخل الجامعة. وكانت مستويات الضوضاء داخل مباني الجامعة كمثيلاتها خارج هذه المباني ، مما يعني أن تأثير النشاط البشري يعتبر ضعيفا مقارنة بالمصادر الخارجية للضوضاء. وقد تجاوزت مستويات الضوضاء الحدود الآمنة المقررة في القوانين البيئية العالمية والمحلية. No previous studies have been conducted to investigate levels of noise pollution inside universities campus in Saudi Arabia. The main aim of this study is the assessment of noise pollution level inside the UD campus. This study is considered as an initial and indicator for other similar universities in the Kingdom of Saudi Arabia. Three different types of locations were selected for measuring noise levels during this study; outside walls (outside the campus itself), the internal streets (campus roads) and inside several buildings of the UD campus. The outside locations included the main coastal traffic road and other branched traffic roads. The internal streets included all main streets, such as the main gate, and some of the branched streets. The buildings included educational (such as college buildings), administrative (such as the main administrative building of the campus) and services buildings (such as library and restaurant). Levels of noise intensity were measured by the Bruel and Kjaer Hand-held Analyzer, Type 2250 Sound Level Meter (SLM). This SLM has the ability to measure instantaneously the following values; the now live and fast LAF (which represents the now live noise level, in which, a reading every 5 s is automatically recorded), LAFmax and LAFmin (which represent the maximum and minimum noise levels during the overall period of measurement), and the equivalent continuous level LAeq (which represents the measured value which needs to be averaged over a period of time for all LAF readings. We consider the LAeq values in our study. The start-up time of this SLM depends on the state the instrument was in when last switched off and it may take up to 2 min from a cold start, or up to 10 s if the instrument is already in standby mode, (i.e., from a warm start). At each selected location, the instrument was operated continuously for 1 min as a start-up time, and for a continuous measuring period of 10-15 min during which several readings of noise were automatically recorded and saved. At the end of this period, the lowest and highest levels in addition to the weighted value (LAeq) were considered as the net results. The one-way analysis of variance (ANOVA) is used to determine whether there are any significant differences between the means with regards to levels of noise measured in this study. As it has been used largely, P < 0.05 will be considered statistically significant. Levels of the environmental noise pollution were measured at three different periods of the academic year 2011-2012 to study the effect of human and traffic activity inside the UD campus. The first one was the "study period" during the five academic studying days (Saturday-Wednesday). This period is characterized by the maximum educational, administrative and other student activities. During this period, two different times were selected for noise measurements; at the morning rush hour (7.00-8.00 am) and an afternoon hour (1.00-2.00 pm). The second period was the "final exam period" during which, measurements of noise were conducted at the first exam hour (8.00-9.00 am). This period is characterized by relatively low activity inside the university because most or all students are present inside the exam rooms. The third period was the "holiday period" which included two main holidays, the midterm and summer holidays. During this period, it is known that most activities inside the university campus are inhibited or completely stopped. Levels of noise pollution inside university campuses vary depending on several factors such as outside activity, internal activity, period of the year, time of the day, and others. Some of these factors were studied inside the UD campus during the current study. Campus of UD is surrounded by traffic roads from all sides; one of them is considered the main coastal road with moderate and sometimes high traffic activity particularly at the morning rush hour. [Figure 1] represents levels of the environmental noise pollution inside and outside the campus of UD during the selected three periods of the academic year. Mean levels of noise outside the campus during the study, exam and holiday periods were 67.1, 64.1 and 62.1 dB, respectively, while those inside the campus were 65.5, 63.1, and 55.6 dB, respectively. [Figure 2] shows mean levels of the environmental noise at different locations inside the campus of UD itself and outside its buildings. It is evident that the highest mean levels were recorded at four locations; at the main gate (71.6 dB), outside the main administrative building (68.3 dB), outside the deanship of registration building (68.2 dB), and at the side gate of the campus (68.0 dB). All of these locations are characterized by the high traffic movement during most of the academic day in addition to their proximity to the outside roads compared with the other sites. Excluding the outside traffic movement source from [Figure 1], it is clear that levels of the environmental noise inside the campus were in accordance with the magnitude of the traffic activity during each period (i.e. the highest mean level of noise was found during the studying period, while the lowest level was obtained during the holiday period). During the current study, levels of indoor noise pollution were measured inside all buildings of the UD campus that included educational building (such as colleges), services buildings (such as the central library and photocopy center) and recreational buildings (such as restaurant). Inside colleges, three locations were selected; one of them was representing the main hall or entrance, while the other two locations were representing two different educational classrooms. In the other buildings (services and recreational), two different locations were selected as measuring points for noise level. [Figure 3] illustrates mean levels of noise inside and outside the main eight buildings of the UD camp. Levels of the indoor noise were nearly the same or very slightly higher than those of the outdoor levels, which indicate that the effect of human activity inside university buildings on noise pollution can be neglected comparing with the outdoor sources. The one-way ANOVA test [Table 1] indicated that, there was no significant statistical differences (P > 0.05) between the indoor and outdoor noise levels. The one-way ANOVA test [Table 1] indicated that, there were strong significant statistical differences (P < 0.01) between noise levels during the three periods of study, while levels of noise during two different durations of the academic studying day (morning and afternoon) were nearly the same with no significant difference (P > 0.05) as shown in [Figure 5]. 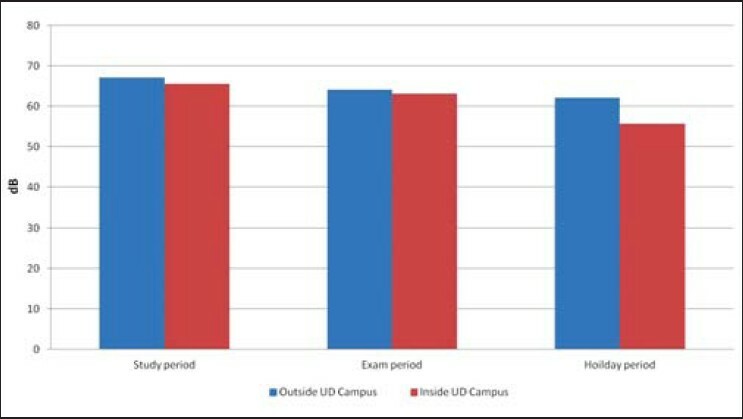 On the other hand, statistical comparison of results in relation to the site activity [Table 2] indicated that there was no significant difference (P > 0.05) between results of outside and inside the UD campus from one side or between results of outside and inside its buildings from the other side, while there was a strong significant statistical differences (P < 0.01) between noise levels of outside the campus itself and inside its buildings. All of these data confirm that traffic activity is considered the main source of noise pollution inside the UD campus. The most human activity within the camp of any university is the educational process and the accompanying services, such as administrative, recreational, cleaning, maintenance, and other services. In spite of the presence of these services within each university buildings, its size and magnitude varies from one building to another, depending on the nature of the educational process itself. For example, human activity inside the practical colleges is generally higher than inside the theoretical colleges because of the presence of labs equipped with several types of instruments and presence of students and technicians for a long time inside these labs. Even in colleges with similar type, the size of human activity varies depending on the size of the college and the number of students, faculty members and workers. All of these factors considerably affect the level of noise inside the building itself, particularly in classrooms during lessons or exams. 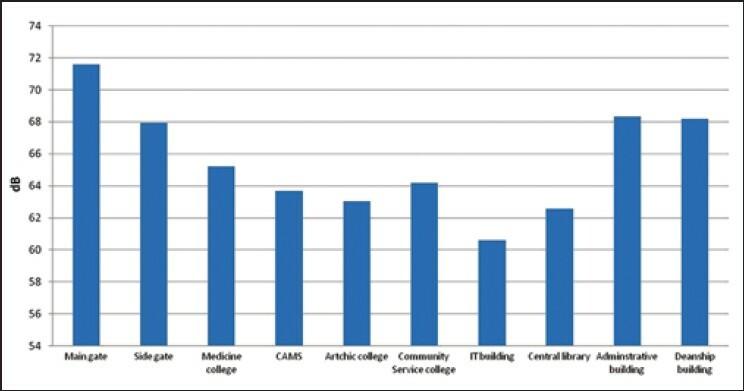 To confirm this fact, a statistical test (one-way ANOVA) was conducted to compare between mean noise levels inside different classrooms of three colleges with different activity, two of them are considered practical colleges (College of Applied Medical Sciences, CAMS and College of Medicine, CM), while the third is considered a theoretical one (College of Community Services). Results of this test are illustrated in [Table 3], in which, it is clear that there was significant statistical differences (P < 0.05) between the practical and theoretical colleges, while there was no significant difference (P > 0.05) between the practical colleges themselves. Location of any university campus is a crucial factor in the noise pollution level inside each campus. Traffic movement inside the UD campus is the main source of the high environmental noise pollution levels, both inside, and outside buildings of the campus. All levels of noise inside the campus were higher than the recommended guidelines, which mean that all occupants of UD are exposed to the bad effects of noise pollution. Avoiding this problem requires the right selection of new university campuses and transferring all car parks outside the campus where internal buses can transport the staff and students to their places inside the campus. In addition, the university administration should recognize its role as an environmentally responsible organization and is committed to promoting environmental awareness for all students and staff. Pirrera S, De Valck E, Cluydts R. Nocturnal road traffic noise: A review on its assessment and consequences on sleep and health. Environ Int 2010;36:492-8. World Health Organization (WHO). Indoor Environment: Health Aspects of Air Quality, Thermal Environment, Light and Noise. Geneva: WHO; 1990. Hunashal RB, Patil YB. Assessment of noise pollution indices in the city of Kolhapur, India. Procedia Soc Behav Sci 2012;37:448-57. Pathak V, Tripathi BD, Mishra VK. Evaluation of traffic noise pollution and attitudes of exposed individuals in working place. Atmos Environ 2008;42:3892-8. Yılmaz H, Ozer S. Evaluation of noise pollution in the respect of landscape planning and solution proposals. Atatürk Univ Agric Fac J 1998;28:515-30. Pandey V. Encyclopaedic Dictionary of Environmental Pollution. New Delhi: Himalaya Publishing House; 1992. Kim KH, Ho DX, Brown RJ, Oh JM, Park CG, Ryu IC. Some insights into the relationship between urban air pollution and noise levels. Sci Total Environ 2012;424:271-9. Fields JM. An Updated Catalog of 521 Social Surveys of Residents' Reactions to Environmental Noise (1943-2000). USA: Virginia, NASA/CR-2001-211257; 2011. King EA, Murphy E, McNabola A. Reducing pedestrian exposure to environmental pollutants: A combined noise exposure and air quality analysis approach. Transp Res Part D 2009;14:309-16. Alberola J, Flindell H, Bullmore J. Variability in road traffic noise levels. European Commission, environmental noise directive 2002/49/EC; Off. J Eur Communities 2005;L189:12-25. Bhosale BJ, Late A, Nalawade PM, Chavan SP, Mule MB. Studies on assessment of traffic noise level in Aurangabad city, India. Noise Health 2010;12:195-8. Vidya Sagar T, Nageswara Rao G. Noise pollution levels in Visakhapatnam City (India). J Environ Sci Eng 2006;48:139-42. Vlachokostas Ch, Achillas Ch, Michailidou AV, Moussiopoulos N. Measuring combined exposure to environmental pressures in urban areas: An air quality and noise pollution assessment approach. Environ Int 2012;39:8-18. Prasher D. Estimation of hearing damage from noise exposure. Bonn, Germany: World Health Organization and European Centre for Environment and Health Report on the Technical Meeting of Exposure - Response Relationships of Noise on Health, 17-19 September 2002; 2003. Murphy E, King EA, Rice HJ. Estimating human exposure to transport noise in central Dublin, Ireland. Environ Int 2009;35:298-302. Michaud DS, Keith SE, McMurchy D. Noise annoyance in Canada. Noise Health 2005;7:39-47. Fields JM. Reactions to environmental noise in an ambient noise context in residential areas. J Acoust Soc Am 1998;104:2245-60. Babisch W, Beule B, Schust M, Kersten N, Ising H. Traffic noise and risk of myocardial infarction. Epidemiology 2005;16:33-40. Department of Security and Safety. Yearly report of traffic division. Saudi Arabia: Dammam, University of Dammam; 2012. Bruel and Kjaer. Hand-Held Analyzers Types 2250 and 2270, User Manual. United Kingdom: Brüel and Kjær Sound and Vibration Measurement A/S; 2012. Environmental Protection Department. Guidelines on Design of Noise Barriers. Government of the Hong Kong SAR Second Issue; 2003. Available from: http://www.epd.gov.hk/epd/english/environmentinhk/noise/guide_ref/files/barrier_leaflet.pdf. [Last accessed on 2013 May 29]. Ibarahim HR. Planning Guidelines for Environmental Noise Limits and Control. Malaysia: Department of the Environment; 2004. Berglund B, Lindvall T, Schwela DH. Guidelines for Community Noise. London, United Kingdom: WHO; 1999. EnHealth Council. The health effects of environmental noise - other than hearing loss. Australia: Commonwealth of Australia, Department of Health and Ageing, Publication No. 3311 (JN 7845); 2004. Martín MA, Tarrero A, González J, Machimbarrena M. Exposure-effect relationships between road traffic noise annoyance and noise cost valuations in Valladolid, Spain. Appl Acous 2006;67:945-58. Clark C, Stansfeld SA. The effect of transportation noise on health and cognitive development: a review of recent evidence. Int J Comp Psychol 2007;20:145-58.